Recent research shows diversified companies need to link their innovation strategy to their diversification strategy. 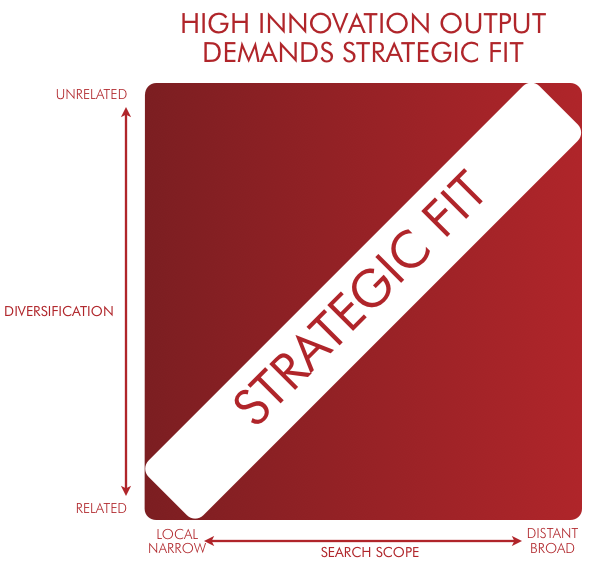 In general a company’s innovation strategy ranges between having a local (i.e. related) focus and a narrow scope and having a distant focus and a broad scope. It turns out the innovation output in terms of number of patents registered is highest when there is a strategic fit between diversification and innovation scope and focus (see figure). Companies with an unrelated diversification strategy reach highest innovation output when pursuing a distant and broad scope.